Bluffton’s Deandre Nassar will be the featured back for the Pirates. Last season Nassar rushed for 434 yards and three touchdowns. PLAYER TO WATCH: Deandre Nassar is a 5-foot-7, 205-pound senior running back who averaged nearly six yards per carry last season. Nassar also excels on the defensive side of the football at the middle-linebacker position. Aug. 24 at Cory-Rawson 7 p.m.
Aug. 31 at Van Buren 7 p.m.
Sept. 7 Ayersville 7 p.m.
Sept. 14 at Crestview 7 p.m.
Sept. 21 at Paulding 7 p.m.
Sept. 28 Allen East 7 p.m.
Oct. 5 at Delphos Jefferson 7 p.m.
Oct. 12 Spencerville 7 p.m.
Oct. 19 Ada 7 p.m.
Oct. 26 Columbus Grove7 p.m.
BLUFFTON – When Jeff Richards took over as the head football coach at Bluffton a couple years ago, he not only wanted to build a stronger program, but also build stronger athletes. Now, entering his third season at his alma mater, Richards seems to be heading in the right direction. After coming off a 4-6 (3-4 in the Northwest Conference) season, Bluffton’s roster boasts a little more size, heading into the 2018 campaign. Richards is hoping the added size will equate to a more physical team – and ultimately more wins. The Pirates return 18 letter winners. “Offensively, we’re really excited,” Richards said. “We have four linemen coming back – three that started the entire season. It’s the first time in the three years we’ve been a staff here, that we’ve had a consistent offensive line; and size-wise, we’re much bigger. We should average well over 200 pounds across the board on the line this year. In the previous years, we were around 180 pounds, tops. Leading the way for the Pirates, offensively, will be Nassar (Sr., 205, running back). Last season, Nassar rushed for 434 yards and three touchdowns. Kaleb Jefferson, who graduated in 2017, led the Pirates with 930 yards rushing and 13 TDs. Nassar also is a state-placer in wrestling. Calling signals behind center for Bluffton will be senior Logan Rhodes. In 2017, Rhodes’ season was cut short, due to an injury. 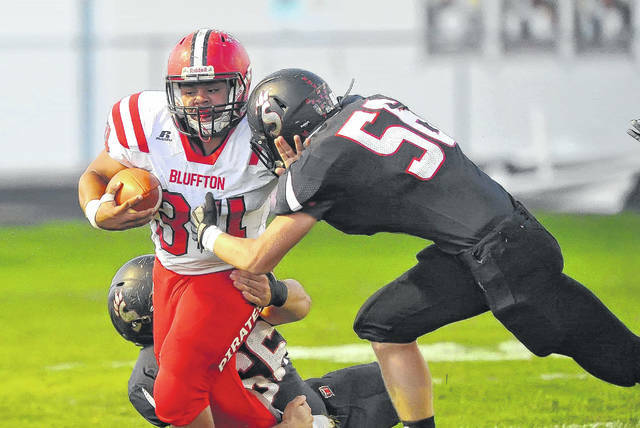 Like last season, Bluffton will run the flex-bone triple option. On defense, Richards is very optimistic. The Pirates will employ a 4-2-5 defensive scheme. “Defensively, we have Mason Ault (Sr., 170) back, who missed the last four games of last season; and he was still named all-conference as a defensive end, because of the impact he made early on,” Richards said. Richards also is excited about his kicking game. “We have an all-conference kicker back with Kyle Koontz (Jr., 140). He’s consistent. He’s one we never had to worry about. He does some really good things,” he said. Richards said his upperclassmen bought into his philosophy, early on. https://www.limaohio.com/wp-content/uploads/sites/54/2018/08/web1_Spencerville-vs-Bluffton-RP-006.jpgBluffton’s Deandre Nassar will be the featured back for the Pirates. Last season Nassar rushed for 434 yards and three touchdowns. This entry was tagged Bluffton, High school football preview 2018. Bookmark the permalink.